The buffet-style setup means you can taste as many dishes as you like and can always go back for seconds! 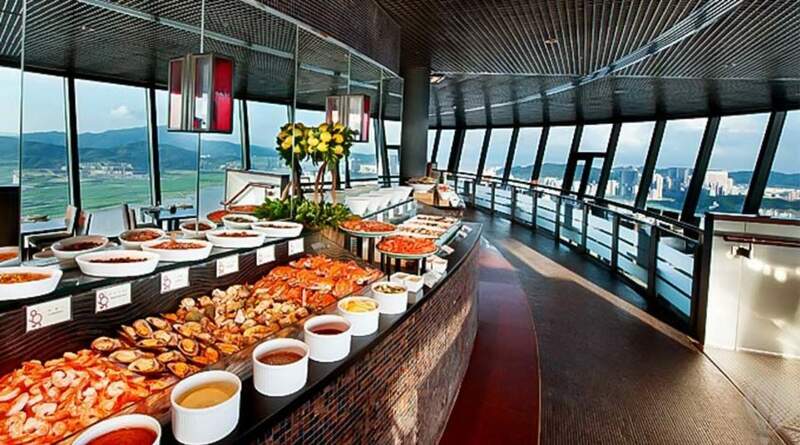 Try some other activities at the Macau Tower: Afternoon Tea Set and the Lunch Buffet! Buffet spread was good and seafood are fresh. Nice ambience for a romantic dinner. 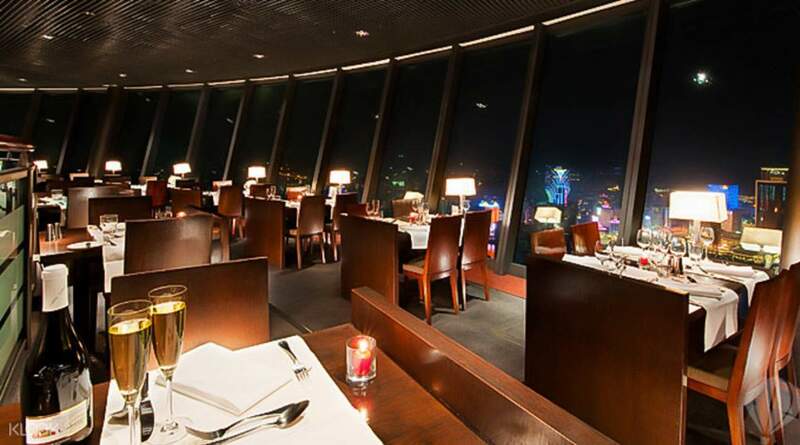 Dine high above the electric nighttime pulse of Macau and enjoying ever-changing views of the sights below in the 360-degree revolving restaurant perched at the top of Macau's most famous tower. You'll be spoilt for choice with the never-ending spread of international cuisines and buffet style dining set up. What's more, your ticket also includes entry to the Observation Deck for a better look at the views, not to mention the courageous adventurers bungy jumping from the top! Indulge in a fantastic array of dishes from Macau, Portugal, China and more! 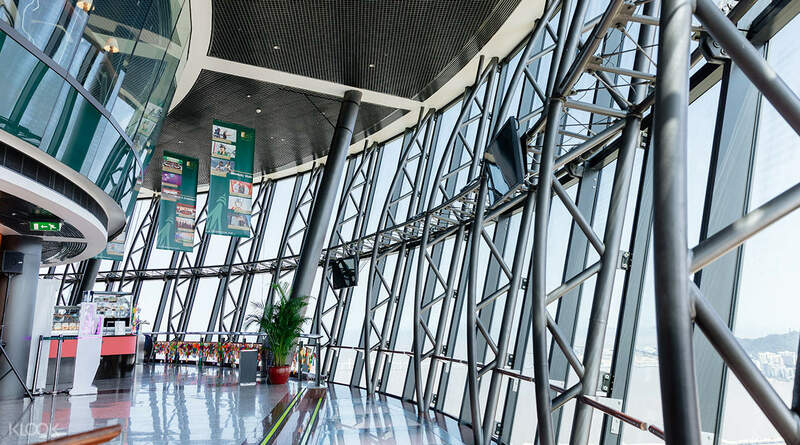 Get to explore the rest of Macau Tower while you're there too! 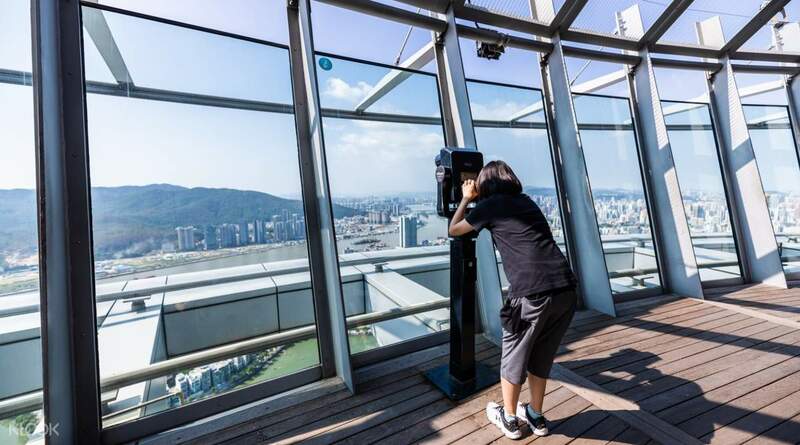 Watch how the city settles at night and enjoy a one-of-a-kind bird's eye view at the observation deck! Great food with wonderful view. Nice place to go and definitely will visit there next time. However, the lobster and oysters are not “all you can eat” this makes me fell sad. Great food with wonderful view. Nice place to go and definitely will visit there next time. However, the lobster and oysters are not “all you can eat” this makes me fell sad. I purchases this voucher for my parent and they are enjoying the food and nice view.They was happiness and klook help me in a convinent way even i was not joined the trip,they just need to present the voucher and enjoy the food. The restaurant staff was very courtesy even It was buffet they still server the special food on table for each of them.Thank to klook staff helping,i did lot of question in the chart before i purchases,they really helpful.This voucher was a Good present for my parent from me. I purchases this voucher for my parent and they are enjoying the food and nice view.They was happiness and klook help me in a convinent way even i was not joined the trip,they just need to present the voucher and enjoy the food. The restaurant staff was very courtesy even It was buffet they still server the special food on table for each of them.Thank to klook staff helping,i did lot of question in the chart before i purchases,they really helpful.This voucher was a Good present for my parent from me. cheaper than buying both observations tower and buffet at once on site. We enjoyed the stunning sunset before going to 360 cafe. Also, watching others bungee jump was so excited. Because of time limitations we can’t try it this time, but we may visit again to try their outdoor activities, like sky walking , climbing to the top and of cause the bungee jump. cheaper than buying both observations tower and buffet at once on site. We enjoyed the stunning sunset before going to 360 cafe. Also, watching others bungee jump was so excited. Because of time limitations we can’t try it this time, but we may visit again to try their outdoor activities, like sky walking , climbing to the top and of cause the bungee jump. we went there in a group of 6, all of us enjoyed the dinner very much. Varieties of food from starter to dessert.... will definitely recommend to friends. Value of money. we went there in a group of 6, all of us enjoyed the dinner very much. Varieties of food from starter to dessert.... will definitely recommend to friends. Value of money. Good view from the tower. Excellent spread of food. Nice quality as well. Good experience of using Klook. Good view from the tower. Excellent spread of food. Nice quality as well. Good experience of using Klook. Awesome view. The food was okay, mixed Asian cuisine. The lightning was a bit dim though. I was worried about getting sick due to the rotation but it was very much tolerable. Awesome view. The food was okay, mixed Asian cuisine. The lightning was a bit dim though. I was worried about getting sick due to the rotation but it was very much tolerable. Buffet spread was good and seafood are fresh. Nice ambience for a romantic dinner. Buffet spread was good and seafood are fresh. Nice ambience for a romantic dinner. 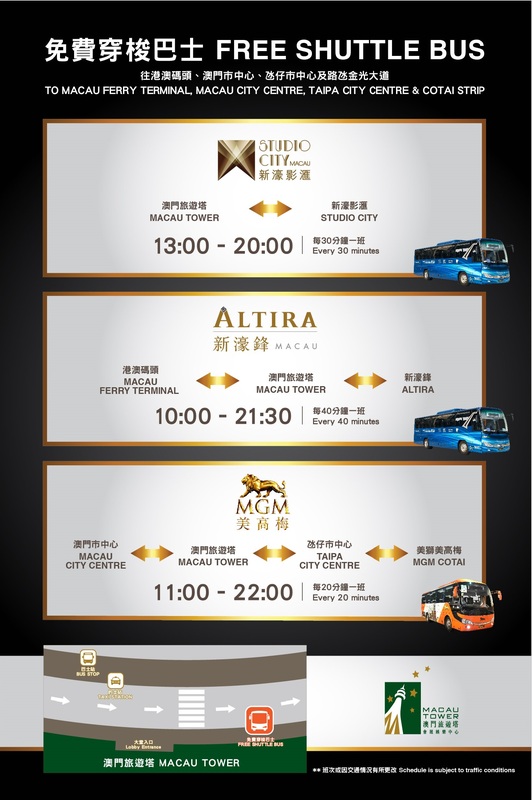 Simple and fuss-free experience of the booking reservation for Macau Tower 360 Cafe Buffet Dinner. Only have to handover the booking printout to one of the service staff and he/she will walk you to your seats! The view is great although the one we had was during nighttime.. daytime would probably look even nicer! 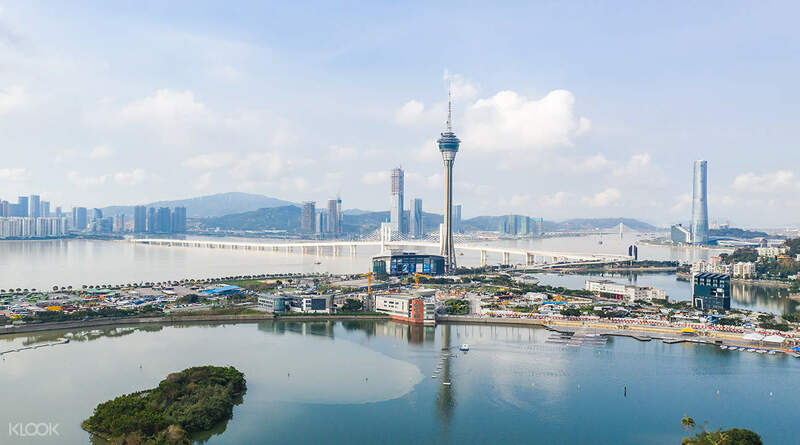 Simple and fuss-free experience of the booking reservation for Macau Tower 360 Cafe Buffet Dinner. Only have to handover the booking printout to one of the service staff and he/she will walk you to your seats! The view is great although the one we had was during nighttime.. daytime would probably look even nicer!